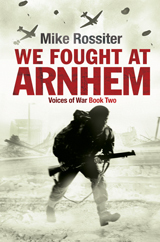 We Fought at Arnhem takes as its backbone the stories of Ron Jordan, Pat Gorman and Tom Carpenter. They were part of the airborne units that landed at Arnhem to capture crossings over the river Rhine. They were meant to hold on to the bridges for three days so that a massive armoured column could relieve them and open up a route into Germany. Tom Carpenter was a sapper in the 9th Field Company Royal Engineers. His units task was to seize a railway bridge over the Rhine. It was blown up as they approached, and he then joined the forces of Colonel John Frost of the 1st Airborne Division and held one end of the road bridge. Pat Gorman was in the 11th Battalion of the 4th Parachute Division and tried to fight his way to the bridge through the side streets of Arnhem. Ron Jordan, an armourer in the REME was part of a forward maintenance unit. He landed in his glider on the second day convinced that “nothing could possibly go wrong.” Two days later, he fought on the perimeter at Oosterbeek as the German SS units tried to wipe out the last remnants of the 12000 men that had landed as part of Operation Market Garden. All three men had seen combat in other theatres of the war and each had volunteered for one of the toughest jobs in the military, that of airborne troops. The battle for Arnhem would be the greatest challenge any of them were to face during the war. For all three of them it would end in capture and incarceration in a prisoner of war camp. Operation Market as the assault on Arnhem was called started to go wrong in the first hours after the landings. Fighting was widespread over a large area. Poor communication and tough resistance from the retreating German forces meant that even the most senior commanders were ignorant of what was happening to their men just a few miles away. Individually, Ron, Pat and Tom saw action in all the main parts of the battle – at the bridge itself, in the town of Arnhem and in the village of Oosterbeek. Their experiences give the reader an insight into the whole battle, and describe in shocking detail what happens when troops storm into a peaceful town, and how desperate the situation of the defenders became as the armoured columns meant to relieve them never arrived. The battle for Arnhem has gone down in history as a glorious defeat, a combination of hubris and planning leading to disaster. It has been summed up in the title of the feature film, “A Bridge Too Far”. There was no glory from the point of view of the men on the ground and in the casualty stations, only a series of blunders and poor decisions that led to nine days of intense street fighting, death and captivity. The stories of Ron, Pat and Tom reveal the true drama of those days from the soldier’s point of view in honest, searing and inspiring detail.